coordinated. He's the intellectual type. One loved it one didn't - me too! Same here, my Jimbo was reluctant to go in the water. I always thought it was because he was so muscled up that he wasn't very bouyant... he was afraid he'd sink! But my Annie can't get enough of the water and especially a water hose sprayed on her. She goes crazy! So you're right, just depends on the individual dog doesn't it? My first Jack adored the water- my second and third one really don't like it. I guess every one is their own! Wow what a great idea, looks like he really is enjoying the ride. Hey please don't let a shark get that little pup! What a neat dog. 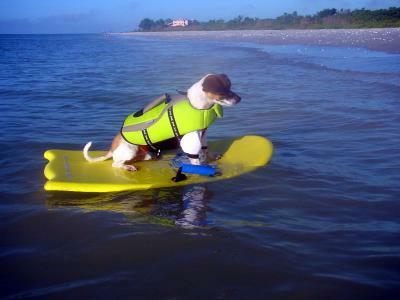 I wish I had a jack russell to surf with me out here on the Calif coast. Hey is Maximo for sale? He gets my vote for November. Oh Mila how cute is that???!!! And isn't that just like a Jack? They have to be in on EVERYTHING .... even surfing?? Thanks Mila. Love this jack.